For educators exploring mobile, large display, virtual reality or augmented reality platforms using 3D, it is important to know the value added benefits of these products. 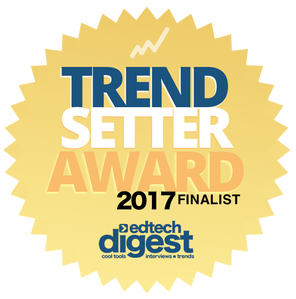 To date, most reports about the effectiveness of using stereo 3D in the classroom revolve around increased retention of learning, ‘wow’ factor, motivation to learn, and higher pre-test/post-test scores. What if there is another benefit we are missing entirely, something much more appealing to educators? One advantage of teaching with 3D, based on recent learning experiences in advantage of teaching with 3D, based on learning experiences in Swedish schools, appears to be the acceleration of curriculum. The growth dividend associated with the acceleration of curriculum seems very attractive. Here’s how it’s evidenced in some Swedish schools. An 8th grade biology teacher using The 3D Classroom stopped having tests in anatomy at the end of a course. Instead he had the 8th grade students teaching what they had learned to 4th and 5th grade students, but using the same 3D visualization tools. This way he could better understand the depth of the 8th grade students’ knowledge. During the experiment, the instructor noticed that the 4th and 5th grade students asked tougher questions than he had imagined they would ask. The biology teacher, curious about what the younger students had learned, conducted another spot experiment. He took the last year’s final test for 8th grade anatomy and gave it to the 5th graders. He was surprised and delighted when the 5th graders scored better on this test than last year’s 8th graders. Humorously, at the same time he was a bit worried what to teach the 4th and 5th graders when they became 8th graders. Stay tuned next week for a post involving curriculum acceleration by even younger students. Collaborative learning approaches. The growing phenomenon of collaborative learning in classrooms is now conspicuous. In most zSpace STEM Labs, I have noticed that students are paired together to work on and solve unique and authentic learning challenges. 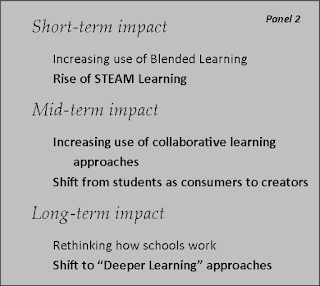 STEAM learning. STEAM refers to science, technology, engineering, arts, and mathematics. It speaks to the workforce needs of modern society. 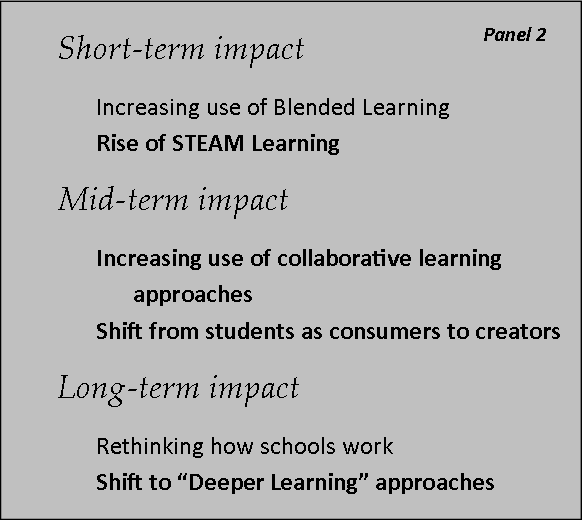 As a result, STEAM initiatives are really gaining traction in U.S. and international schools. 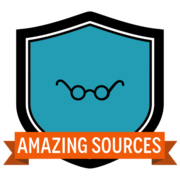 Now, imagine a tool that combines each of the elements of STEAM in one learning experience. To me, that’s another way to go outside the single lane trap. Shifting students from consumers to creators. More and more, teachers are shifting their thinking away from students as consumers of technology. Instead, educators value students being able to produce with technology. 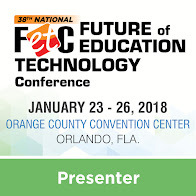 In recent exhibit hall walkthroughs at educational conferences, I notice that almost every product is focused on pouring information into the minds of empty-vessel students, using the technology du jour. It truly strikes me as anachronistic. Actually, it’s the pathway to extinction, because more and more educators are making the shift to “students as creators” with technology. The design, construction, hypothesis-testing, and hand-on emphasis of the zSpace STEM Lab appears to support this transition well. Deeper Learning and MakerSpaces. The shift to deeper learning signals that it’s time to move beyond the typical low-lying fruit of recall, memorization, and motivation. Motivation is a nice contributing outcome, but we need deeper and more results-oriented learning. Students need to design, to build, to explore, to do, to enact, and to perform their learning. This is something that’s easily done with great visualization and design tools like zSpace, which is a ‘maker’ technology by design. Rethinking the Roles of Teachers. According to the Horizon Report, “teachers simply cannot take on the same roles they have traditionally held as lecturers and information dispensers.” The Report adds: “This …underscores the need for teachers to rethink their pedagogies and curriculum in ways that enable students to customize their own paths.” See this video for an example of a successful Los Altos School District pilot project that is changing the role of the teacher. 3D Printing. This video for an example of zSpace embedded within a 3D printing and design ecosystem. Complex Thinking. According to the Horizon Report, the term “complex thinking” refers to the ability to understand complexity, a skill that is needed to comprehend how systems work ...” The Report tells us: “Another key skill of complex thinking is the ability for students to make complex ideas understandable, using data visualization, media, and other communications techniques.” Visual technologies like zSpace help make this possible for educators. I’d like to end this series with some key questions. What technologies are you using? Do you find your current efforts consistent with the vision of the future evidenced by the K12 Horizon report? Can the technologies you pursue have a broader impact than you originally imagined? Do you have to stay in one lane with your technology? Are single-lane technologies worth the investment? What’s in your pocket? The New Media Consortium (NMC), together with the Consortium for School Networking (COSN), recently released their annual K12 Horizon Report, an international report which is useful for educators contemplating how much they have accomplished or where to go next with their technology initiatives. 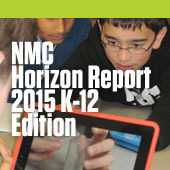 According to the NMC, “The NMC Horizon Report series charts the five-year horizon for the impact of emerging technologies in school communities across the globe.” And this report has been around a long time. “With more than 13 years of research and publications, it can be regarded as the world’s longest running exploration of emerging technology trends and uptake in education.” The full report can be accessed here. Although the K12 Horizon report largely speaks for itself, in this post I will offer a bit of translation, along with a new twist for thinking about this venerable report. With full disclosure, I served as one of the 50+ panelists who developed this report over many months. Serving as an expert panelist for the Horizon K12 report, I can add beneficial nuance to the findings, from an inside perspective. When reviewing the K12 Horizon Report, it is always heartening to see a trend or development come across the radar that validates one of your existing technology initiatives. Such is the case with 3D and virtual reality. It is also insightful to see a yet untraveled pathway beckoning us, crying out for our future technology investment. But do you ever feel like the technology journey is so daunting? That the sheer number of technology choices or lanes is overwhelming? I certainly feel that way at times! Still, there is hope. You see, sometimes a single technology can have a broader impact, cover a richer swathe of learning experiences, than we think. In this way, an innovative technology can pack a bigger instructional punch than we originally imagine. Here’s a hot tip. Some of the finest 3D I have ever seen comes to us via OGON and their ColorCode 3D technology. Among many installations, this technology made two immense power plays in the past—once at Super Bowl 2009, the other occasion in an entire slate of Time magazine holdings (Time, People, Sports Illustrated, Fortune, and Entertainment Weekly). And I am not exaggerating here. The 3D is simply remarkable. Frankly, I don’t know why this low-cost technology never permeated the education market. 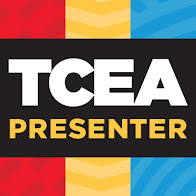 If you are an educator interested in pursuing 3D in the classroom, or a 3D content producer, check them out. And if you are interested in brainstorming about this remarkable technology, just send contact me and let’s brainstorm its application for the education market. 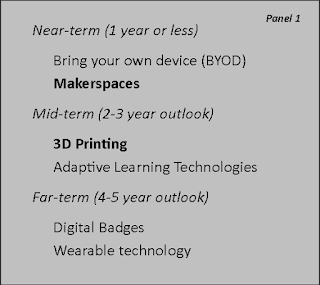 CoSN (the Consortium for School Networking) has released their latest Ed Tech Next report “Dimensions in Learning: Visualizing, Designing, and Making in 3D.” The report focuses on the growth and potential of 3D in education. CoSN is a leading international professional association for district technology leaders, representing over 10 million students in school districts nationwide and is a powerful and influential voice in K-12 education. Once or twice a year, CoSN releases their well-respected Ed Tech Next report. 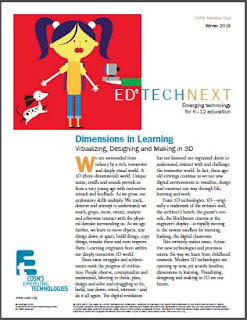 Ed Tech Next reports are periodic publications which examine hot emerging technologies. Designed for busy professionals, these reports provide quick snapshots of rapidly changing fields, followed by succinct summaries of the issues as well as discussion questions or case studies to guide organizational thinking. CoSN’s EdTechNext reports are supported by a pantheon of companies: Amplify, BestBuy, CDW.G, Cisco, Comcast, Dell, ENA, Filewave, Google, HP, iBoss Security, iDentityAutomation, Ipswitich, itslearning, JAMF Software, Juniper Networks, Lenovo, Lightspeed Systems, McGraw Hill, Microsoft, Pearson, Presidio, Promethean, Qualcomm, SchoolDude, Sprint, and Verizon. The report, as the title indicates, focuses on the three “learning families” of 3D in education: designing in 3D, visualizing in 3D, and making in 3D. Each of these components is supported in some measure by the projector, large display, and mobile display technology industry. [The same] struggles and achieve­ments mark the progress of civiliza­tion. People observe, conceptualize and understand, laboring to think, plan, design and solve and struggling to fix, build, tear down, retool, reinvent—and do it all again. The digital revolution has not lessened our ingrained desire to understand, interact with and challenge the immersive world. In fact, these age-old strivings continue as we use new digital environments to visualize, design and construct our way through life, learning and work. Enter 3D technologies. 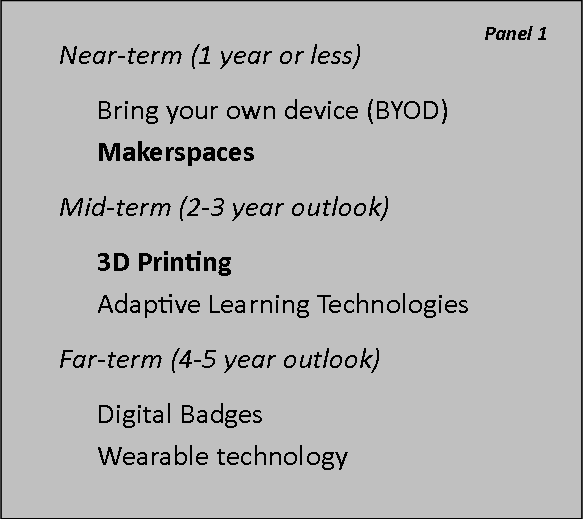 3D—origi­nally a trademark of the artisan’s stall, the architect’s bench, the gamer’s con­sole, the blockbuster cinema or the engineer’s display—is rapidly moving to the newest sandbox for learning, hashtag, the digital classroom. The report claims that 3D merits consideration for its educational value proposition, not its “wow” factor. “In other words, what matters is the potential for improved learning with 3D technologies, not merely the pizzazz of 3D visualization, design or printed objects.” The report then goes on to cite recent research indicating the benefits of 3D technologies for visualizing, designing and making; numerous industry players in the world of 3D in education; and a rich list of available resources and references.